CASCADIA RAIL, A New Advocacy Organization for Cascadia High Speed Rail has launched. Their goal is to get a feasibility study passed during this legislative session, and they need your help. Read on for more information. While there is high support in British Columbia and Oregon, currently Washington State legislators are drafting the budget and considering funding a $3.5 million dollar study for Cascadia high speed rail – the first step to making this dream a reality. We have until the session ends on March 15th to convince legislators to help make this possible. When approved, this study could be completed as early as 2019, making the dream of Cascadia High Speed rail much closer. If you are an advocate of Cascadia rail – below are some simple steps that every person can take to suppor the idea. Share Cascadia Rail on social media. 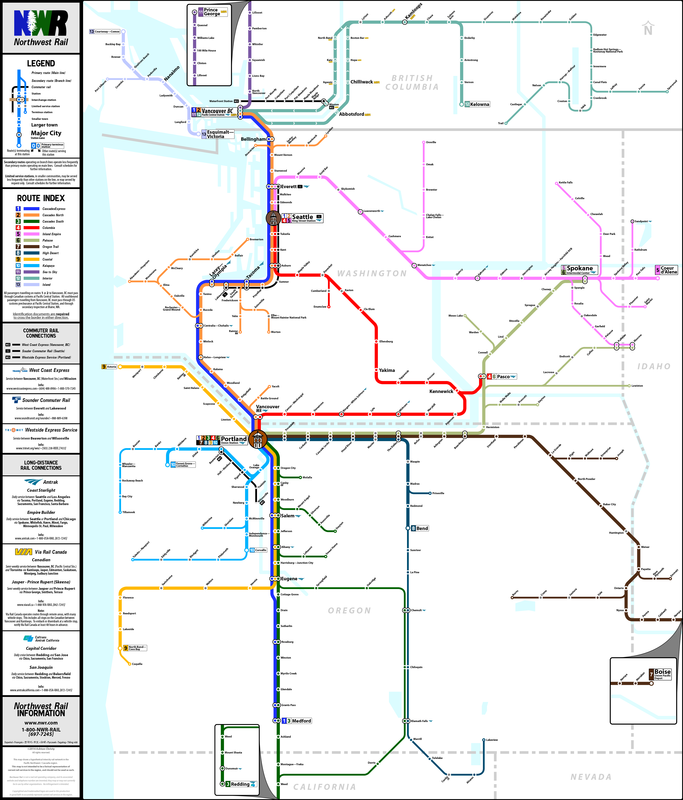 Share this Really Cool Cascadia Rail Map! This helps apply pressure to legislators to support the High Speed Rail transportation study in this session: https://actionnetwork.org/letters/fund-the-cascadia-ultra-high-speed-ground-transportation-study. In the meantime Cascadia Rail is looking for passionate individuals to form chapters throughout the bioregion to help promote high speed rail. They are looking for 5-6 people in each community focused on political engagement, writing, media, and outreach/campaign building to help be watershed ambassadors for best connecting with local change makers. Email Cascadia Rail here to connect if you are interested. 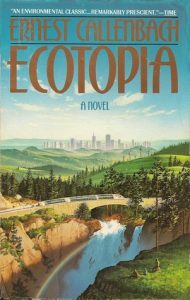 High speed rail has the true potential to help create positive, sustainable forms of transportation that could truly bring the Pacific Northwest together, from North of the Border, to east of the Cascades, and down to Eugene, Oregon. 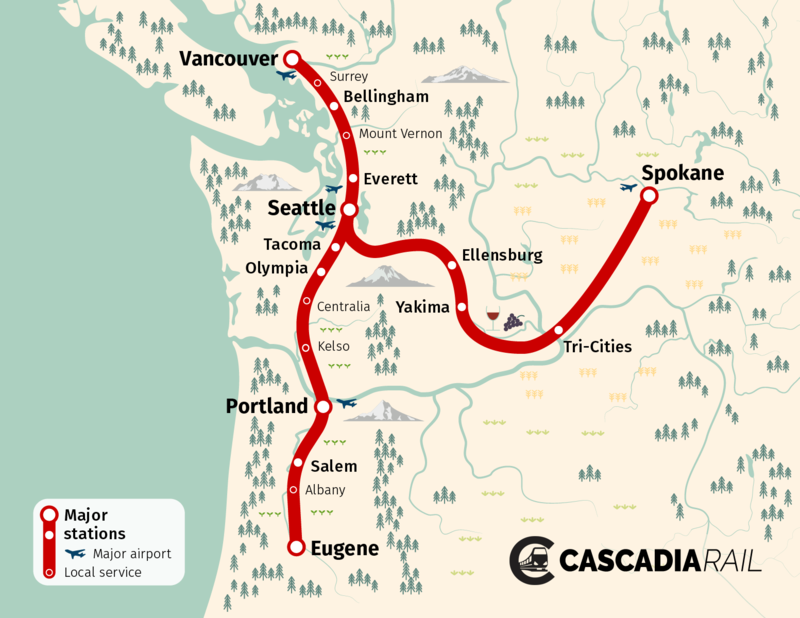 To help steward this vision, Cascadia Rail is a new coalition of advocates spanning from Vancouver, Bellingham, Seattle, Spokane, Tacoma, and Portland who support multi-state efforts to connect the Cascadia region through high-speed intercity transport. The analysis assumes the use of maglev technology, which uses magnets to lift a train off its tracks and move it along a guideway at more than 400 km/h (250 miles per hour), reducing the time it takes to get from Vancouver to Seattle to under an hour. Along the way from Vancouver would be stops at Bellingham, Mt. Vernon, Everett, Seattle, Tacoma, Centralia, Portland, Salem and Eugene, eventually to extend eastward all the way to Spokane. The time from Seattle to Everett or Tacoma? 13 minute and change, while the whole trip would range about one and a half hours. Driving the I-5 corridor length (684km / 425 miles) takes around 8 hours currently. Would take around High speed rail remains the only alternative form of mass transit both faster and more cost competitive then flying or driving. It pegs the project cost at around $40 billion which would be split between the two states and province, with additional support from federal grants, and private business investment from companies already committed to the idea such as Microsoft. While this sounds like quite a price tag – highway and road projects are some of the most expensive in the country, ranging nationally from $1.9 million per lane mile for simple widening projects without interchanges and large structures all the way up to $375 million per lane mile (for each lane paved) for the 2 mile long deep bore Seattle Alaska Way Viaduct project. In comparison, $40 billion split between three states or provinces spread over. Other groups have long been proponents of the idea, such as Cascadia High Speed Rail and at some point will hopefully join forces to support the idea. 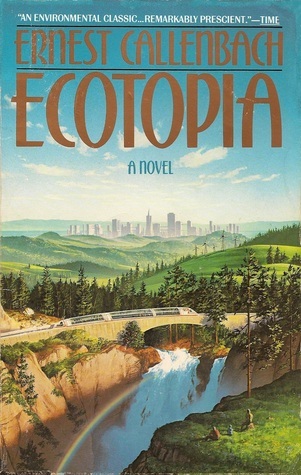 Cascadia High Speed Rail has long captured the imaginations of Cascadians, from the cover of Ecotopia in the 1970’s to this beautiful envisioning of what a comprehensive northwest rail system could look like. It’s good for workers and quality of life. Short commutes are more than a luxury; they’re critical for reduction in income inequality. High-speed rail can reduce a 1½-2 hour commute to 15 -30 minutes. That’s extra time each day you can spend with your family or on your favorite activity. It’s good for business. The world economy is driven by global cities. Home to thirteen Fortune 500 companies, the Cascadia Innovation Corridor is expanding in-demand jobs, which can be made accessible by reducing the effective distance between our cities. It’s good for tourism. Seattle’s 39 million, Vancouver, BC’s 9 million, and Portland’s 9 million annual metro-area visitors spend $4 to $7 billion per metropolitan area and generates an abundance of local tax revenue. Fast, easy connections help more people see more places including wine country, Spokane, and all the iconic small towns in between. It’s good for economic development. Disproportionate economic growth is occurring in our largest cities. By making fast, convenient, and reliable connections between more places, all of our cities become increasingly attractive for commercial and residential urban growth. It keeps our great places great. Cascadia is an amazing place. We should experience more of it while spoiling it less with long car trips and congested roads. 2018 Cascadia High Speed Rail Study (PDF): Prepared for the USDOT by CH2M HILL, from Portland, OR.